The bride adjusts a bracelet on her flower girl's wrist before her wedding at the Bank House Hotel in Worcestershire. The Bank House Hotel in Worcester is a wonderful venue for weddings all year round. With 61 bedrooms and huge indoor space, the hotel is able to host weddings of up to 500 people. One of the hidden gems at the Bank House Hotel is the huge penthouse apartment. It was here that Steph and her wedding party chose to get ready on their morning of her wedding. In the early morning of the wedding, there was a layer of thick cloud which provided a beautiful soft light. 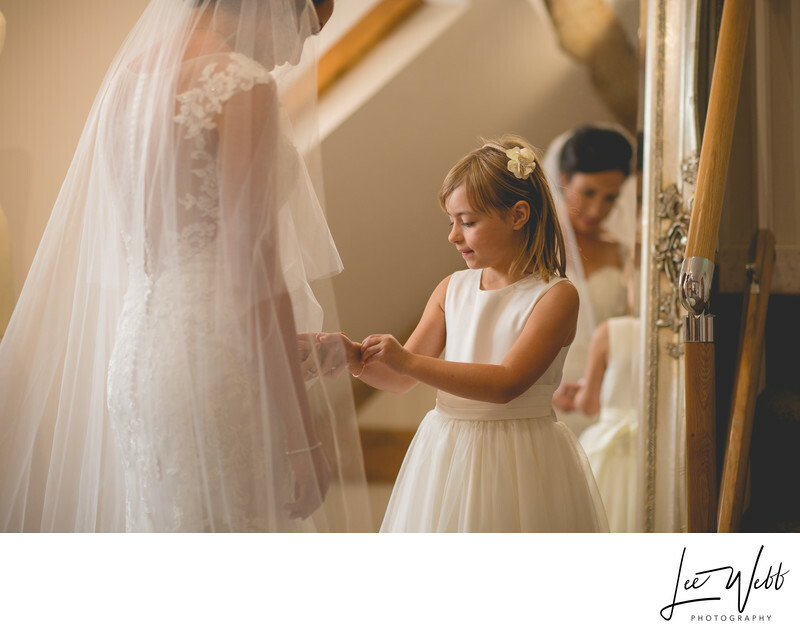 This image, showing the bride helping her flower girl put a bracelet on, was taken next to a skylight which provided the delicate light you can see in this image. It's moments like this that reportage photography was made for. I could see the flower girl was being given a present from the bride, and decided to shoot this scene with a long lens and from a distance. When photographing children at a wedding, their awareness of a camera being present can really change how they act. In order to capture the most natural moment it's important to stand well back and let beautiful moments like these play out.